Our three days in Rome came at the end of a two-week self-guided tour through northern Italy. We had seen a lot already, and we didn’t want more of the same. We were not disappointed. Three days was long enough for us to make some wonderful memories. Keep reading and you’ll learn what made our visit memorable…and why it was so good to travel with family! Rome was our last stop on a trip with my husband, my daughter, and her husband. My son-in-law served a church mission in Italy a few years ago and had always wanted to return. When he and my daughter invited us to join them, I was thrilled. Traveling with your family is so much fun! You will have shared memories that last a lifetime AND traveling together cuts costs for all of you–apartment, car rental, even meals. Oh! And my SIL speaks fluent Italian–another bonus! Day 1 We walked to the Piramide metro station where we purchased one-day passes for 6 euros each. It took two metro lines to reach the Colosseum and Roman Forum & Palatine Hill. Here we used one of the most valuable Rick Steves’ tips I’ve ever found. Don’t wait in line at the Colosseum–it is crazy long and there’s no need. Tickets to the Colosseum include admission to the Roman Forum/Palatine Hill, and tickets are sold at both locations. So we passed the Colosseum, went to the ticket booth for the Roman Forum, and got in line behind 5 people! Our tickets were only 12 euros each. We probably spent about an hour at the Roman Forum & Palatine Hill. Lots of ancient structures and architectural details–plenty of plaques to describe what it all used to look like. Pretty amazing that so much is standing after so many years. Next we headed to San Pietro in Vincoli (St. Peter in Chains), a Catholic minor basilica famous for housing the Moses statue by Michelangelo, completed in 1515. The basilica also houses the reliquary containing the chains that supposedly held Peter while he was imprisoned in Rome. The ceiling fresco of “The Miracle of the Chains” by Giovanni Battista Parodi (1706) is also very beautiful. Our next stop was the Colosseum. It was everything I had imagined–of course, it’s the most iconic symbol of Rome. It’s ancient, and it’s huge, and it was very cool to finally be standing within its walls. But it was also very sad. It’s an awful symbol of the corruption and wickedness of the Roman leaders. The more I thought about it, the more I wanted to leave. After leaving the Colosseum, we chose an American-style restaurant called Dakota for lunch. Not very Italian, I know. But the price was right, and we were hungry! From there, we went to see the Pantheon, an ancient temple to all the pagan gods, built about 120 AD. It is one of the most well-preserved buildings of ancient Rome. Check out this link for a panaramic video of the inside of the Pantheon. After the Pantheon, we happened upon an interesting church. Built in 1650, the Chiesa di Sant’Ignazio di Loyola is not considered one of the major tourist sites in Rome. But we’d learned that some of the best art can be found, free of charge, in churches. And that was certainly true of Sant’Ignazio. The brightly colored Baroque ceiling fresco by Andrea Pozzo is spectacular! Our next stop was the Trevi Fountain (not sure how you ever get a photo of this attraction without tons of tourists in it). There are water pipes where you can fill your water bottles, and it’s very good drinking water–that actually surprised me! On to the Spanish Steps…at the top of the Spanish Steps is a French church–Chiesa della Trinita dei Monti. The Spanish Steps were built as a symbolic joining of the French and the Spanish because they linked the French church and a Spanish embassy at the bottom of the hill. 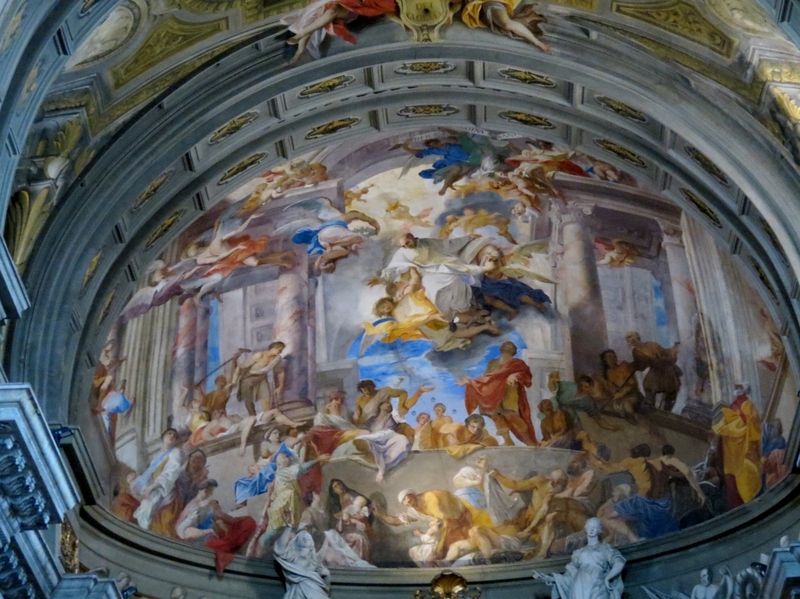 There is some beautiful art in the Trinita dei Monti, but we didn’t have the best experience there. Let’s just say the “ushers” were a little rude, so we didn’t stay long. At this point, we didn’t have anything on our agenda. We decided to get back on the metro and go to the next stop and just explore. This turned out to be a great decision. We came out of the metro station near the Teatro dell’Opera, in the Piazza della Repubblica. Some ancient ruins caught my eye, and we walked over to explore. With a very modest entrance, by most Catholic church standards, we discovered the Basilica Santa Maria degli Angeli e dei Martiri (Basilica of St. Mary of the Angels and the Martyrs), which had been designed amidst the crumbling walls of the Baths of Diocletian (306 AD). This was Michelangelo’s last architectural work as he died soon after completing the Basilica at the age of 88 years. It was the most unique of all the churches we visited throughout Italy. The ceiling is very high and light pours in through upper windows. The basilica was awe-inspiring in its size and beauty. It seemed to celebrate science as well as religion, with its sundial, pendulum, and holes in the roof meant to highlight several stars. Definitely my favorite! By now, our first day in Rome was coming to an end. We made our way back to the apartment, where we fixed Carbonara for dinner. We spent some time planning, journaling, and playing card games–one of our favorite family pastimes. Then we went to our newly-discovered gelateria just down the street and bought gelato for only 2 euros each! At this gelateria, they put melted chocolate in every cone first, to keep melting gelato from leaking out the bottom–great idea! Who can’t use a little more chocolate?! Exciting news! You can download this article free to your device, so you can read it offline. For a small fee, you can upgrade it to a GPS-guided article. You won’t need the internet or data to be guided through Rome! If you do, I will receive a few cents, which helps to keep this blog going. Wow! Reading this takes me back to Roma! I loved it there, and I love how you described each location. I agree with your feelings about the Colosseum; it did seem like an eery place to be, seeing that so many innocent people died there. In spite of that, overall I was just so impressed by Rome’s overarching “ancient-ness!”. It felt so awesome to walk the rough rock streets knowing that others thousands of years ago had done the same. We love Rome…so many wonderful things to see. You made the most of your three days! Great post! Thanks, Tisha! I’m glad you enjoyed it! I hope you do get to go… We really enjoyed it! This is brilliant! I’m in Rome as I’m writing this and its helped! Well, there’s never enough time to do everything! But choose the things that will be the most meaningful to you and really enjoy the memories you’re able to make. I hope you have a wonderful trip! Really useful great read. Thanks for the great post. You did so much in three days! The history must be incredible. I like the idea of staying in a Homeaway, I haven’t tried it yet, but maybe one day I will. We did do a lot, and yet, we had plenty of time to relax at our apartment in the evenings, too. We cooked dinner (savings tons of money! )played cards, and ate gelato, and planned the next day’s activities, caught up with emails and instagram, etc. That’s why we like using Homeaway so much. It’s much nicer to have an apartment than to be stuck in two hotel rooms without a central place to hang out together or to cook our meals! I’ve been to Rome several times, each trip only for 2-4 days. Your itinerary is perfect for cramming it all in! Although I would also just throw it all away and wander from gelato place to gelato place! Great post, gives people an itinerary to work with and lots of awesome photos. Apartment rental is a great idea too. What time of year did you go? I imagine in the high season lines and crowds would slow things down in such a popular city. We visited the first week of May. It was not too crowded! Did you eat or take a break?? lol I’m glad to know you’ve enjoyed Rome in 3 days. Ha-ha! Of course! We probably had gelato breaks two or three times a day! We ate our lunches out, and cooked dinners in our apartment. It saved us tons of money to do it that way! Wow – so much in just three days! I haven’t been yet but I will be definitely coming back here before I do, based on what you have written and the comment you have pretty much nailed. Well done and thanks for taking the time to put it all together! Thanks, Matt! I hope it’s been useful! As a history student, the Colosseum is one of those places that have special resonance. Its one of the oldest remaining buildings on earth and I can’t wait for the day we get there! It was truly amazing to finally visit the colosseum in person! I love Rome! Thanks for letting me reminisce about my Roma adventure. I miss the gelato…omg the gelato. The pictures make me wanna visit Rome even more! I have always been in love with Italy, though I have never been. I even studied Italian for a bit. Good to see that I can get so much done in 3 days. It must have been an even better experience you get to do that with your family. Love how informative the post. I will sure save it for when I do visit! It was definitely more fun to visit with family. We have so many wonderful memories now! Brings back a lot of different memories from my study away trip that went through Rome. Self-guided tours are always nice. I also like the apartment rental idea; it automatically makes you more of a local. The apartment rental was the perfect way for us to be close to attractions and still save money! Wow, it looks like you hit all the spots! I’m going to Italy in May and I couldn’t be more excited! This post has me even more looking forward to it. Apartment rental is a GREAT idea as well. Lucky you! And May is a great time to go. It gets really hot after that! Be sure to let me know how you enjoy your trip! You have managed to see quite a lot of things in one day in Rome. I have visited Rome so many times and I still love it to bits. I could stroll along the Roman Forum and the Colosseum for hours and don’t get bored. I agree. It was so wonderful to stroll and even get a little lost among all the ancient historic ruins. Thanks! I’m so glad you found it helpful. And yes, the paintings and monuments are really spectacular! Meagan, thanks for confirming my secret – that churches are a great wealth of art! Madeline, the tickets I bought for the colosseum are not “skip-the-line” tickets. But in essence, that’s what they accomplished for me. Admission to the Colosseum includes admission to the Roman Forum (just across the street), and vice versa, admission to the Forum includes admission to the colosseum. So, instead of lining up at the colosseum in a huge queue to buy your tickets, simply walk across the street and buy your tickets at the Roman Forum instead, where there are about 10-20 people in line instead of hundreds! If you purchase the GPSMyCity version of this blog post, you’ll have embedded GPS coordinates for every place I mention in my blog article, including the exact location of the ticket booth where we purchased our Roman Forum tickets. You definitely fit a lot into your first day! We were in Rome for a week and I still didn’t feel as if I had enough time lol – though you utilized your time perfectly. Great tip on picking up tickets to the Colosseum at the Roman Forum – yes those lines are CRAZY!! Totally agree with you on the mixed feelings of being at the Colosseum – on one hand it’s an iconic, awe inspiring structure and an incredible feat of one of the greatest Empires of our time. But if definitely represents some horrific actions of mankind. Glad you enjoyed your time though!